The Uzbeks are onto something big. Something genius, something amazing. And if it hasn’t gone global in the next five years then there is something seriously wrong with the world. Try Before You Buy Biscuits. Yes you heard me correctly, you can try biscuits here before buying them. So just to clarify, you can stand in the supermarket aisles munching biscuits BEFORE buying them. Admittedly, there would need to be some biscuit reform back home before this could really take off. I’m not sure how McVitie’s would feel if people were opening fresh packets of Ginger Nuts, taking one and then discarding the packet before reaching out to try a Maryland instead. 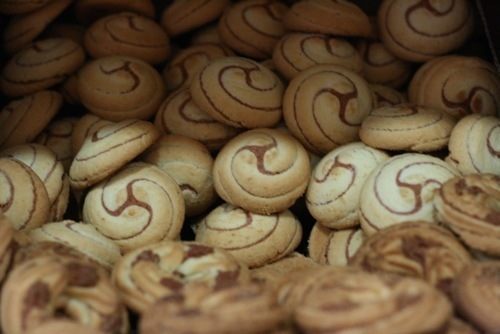 But here you see the biscuits aren’t wrapped – they are just baked and thrown onto the shelves in neat little lines, ready to be sampled and bought, and mixed with others. It is a much better biscuit system altogether. Who wants a straight pack of 36 ginger nuts instead of a selection of cookies, ginger nuts, chocolate sensations and melt-in-your-mouth-butter-numbers… and more? But this is just the beginning of biscuit philosophy. There are after all so many unanswered questions. Why do mixed biscuits only appear in fancy tins at festive times in the UK? Why can’t we pick n mix our biscuits and taste them as we go? Allow me to set the scene for you. We are in Globus supermarket in Tashkent, it is hot and sticky but the store has air conditioning so we spend a little longer than necessary there, looking at the shampoo on offer and the size of tomatoes etc. Then, suddenly I turn a corner to find a whole aisle – devoted to pick n mix sweets… And biscuits. The next bit is a bit of a blur, but I definitely stand there gawping long enough for the biscuit supervisor to come over and give me a sympathetic look. Her job is to look after the biscuits and bag up the glorious nibbles as requested. I think I give a goofy smile at this point and mutter something in English. She nods understandably, she’s seen my kind before. The kind from the land of formulaic packets of biscuits and Bourbons. Gently she guides me through the process and I blink enthusiastically. ‘This one?’ She seems to say in Russian, holding a Catherine wheel of a biscuit up in her plastic-gloved-right-hand. Yes, yes I nod, grabbing the biscuit a little too hastily. 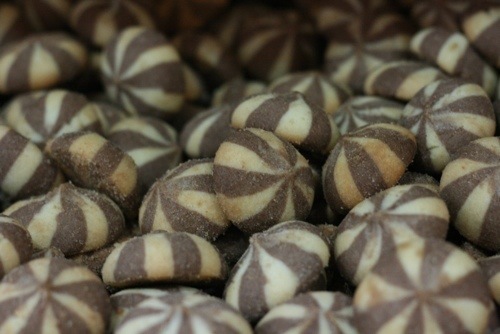 Deliciously crunchy, the thick biscuit breaks away in the middle to reveal a gooey, rich chocolate filling. I can’t help but exclaim as my tongue makes contact with the centre and she smiles and laughs. She’s seen it all before. Next up, the big, brown, crunchy number that tastes like a Ginger nut with a slight cinnamon twist. It makes me grin like a mad woman and insist she bags up a fistful of the biscuits. And the lighter ones to the left, they seemed to taste even better – although I can no longer remember what of. She has me and we both know it. I am glued to the spot just tasting biscuits and moaning inappropriately. Matty finds me in this sweaty, sugar induced coma-like-state and starts talking like someone who is on a very different level. “What’s going on here then,” he said, or something like that. Smiling, she hands us two wafer like tubes. I nod fiercely at Matty, somewhat relieved he was getting his own to sample and not sharing mine. 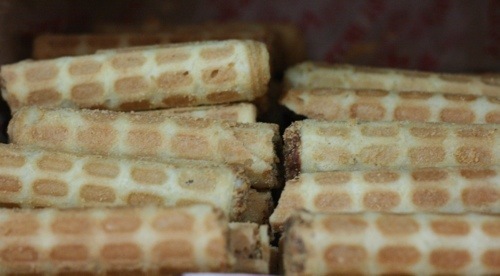 This time the crispy wafer oozed with a chocolate-caramel flavoured filling inside its crispy shell. “Yes, yes”, I cried, hurrying her to fill up the bag. Matty looked down at my hands, now clutching at least five bags of different biscuits. “I thought we were getting some lunch,” he said. “I’ll get an orange or something as well,” I assured him. But truth be told I had already had my lunch. 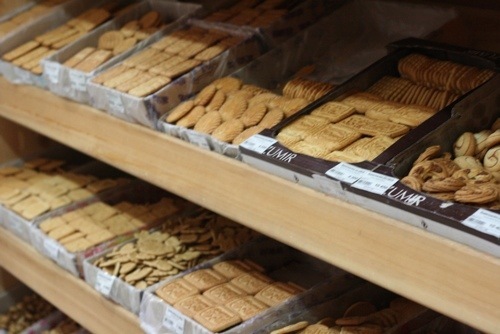 In the biscuit aisle of the Globus Supermarket in Tashkent. These were for dinner. This entry was posted in Recent Posts, Uzbekistan by Delia. Bookmark the permalink.